One of the most interesting aspects of PGM evolution has been a distinct tendency to develop role specific weapons. Two paths are pursued in this quest, with modular families of weapons spawning ever growing numbers of sub-variants and subtypes. Only occasionally is it that an entirely new type of munition is developed - this seems to reflect the pressures of a role so thoroughly divorced from the existing that a new airframe must be used. Of those weapons revealed publicly over the last two years, two are outstanding for these reasons. The AGM-130 is a growth version of the well established USAF glidebomb family, while the AGM-136 is new both in concept and in implementation. Both of these weapons reflect the realities of the modern tactical air-battle, where the electronic battle is fought just as intensely as the physical battle. Not surprisingly, dilution of the opponent's resources is a powerful means of gaining the upper hand and both the AGM-130 and AGM-136 serve this purpose, playing their respective roles both in the physical and electronic battles. The AGM-130 is a direct descendent of the very successful GBU-15 cruciform wing glidebomb. 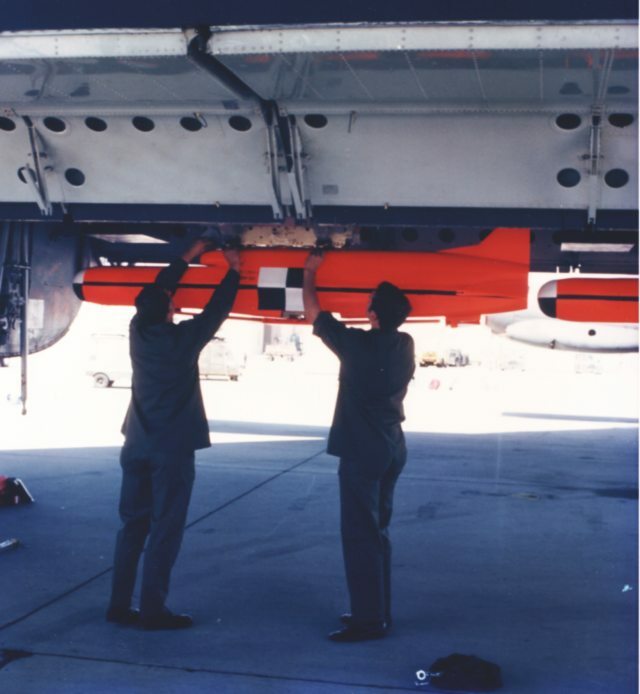 The GBU-15 (see TE June 1984 p65) was developed as the USAF recognised the need for a non-line-of-sight precision guided bomb for low level attacks on high value heavily defended point targets. 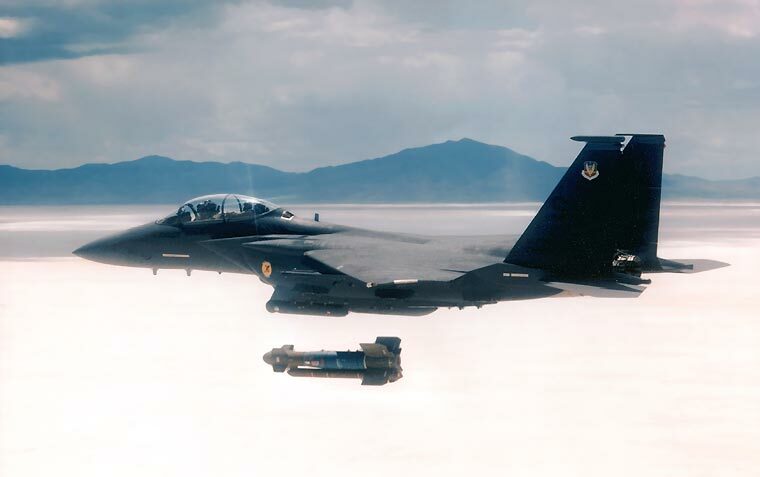 The basic GBU-15 followed in the path of the Paveway and HOBOS guided bombs and was implemented as a modular strap-on kit to be fitted to a Mk.84 Unitary Warhead, the core of the standard US 2000lb demolition bomb. The basic subtype of the GBU-15 carried a stabilised vidicon (TV camera tube) in its nose assembly which transmitted imagery to a tail assembly mounted datalink subsystem. The datalink carried the video imagery via a Hughes AN/AXQ-14 datalink pod to a Head Down Display (CRT) at the Weapon System Officer's station in the launch aircraft. Steering commands from the WSO's tracking control handle are then transmitted by the AXQ-14 to the autopilot and guidance systems of the GBU-15. In a typical launch the F-4 or F-111 carrying the weapon would approach the target area at low level and pull up steeply several miles from the target to loft the GBU15 and thus maximise its glide range. 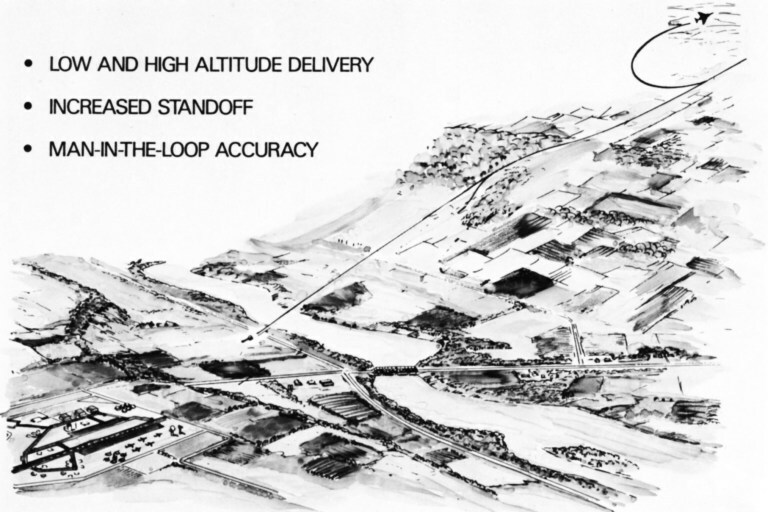 The GBU-15 would then continue under midcourse autopilot control, receiving updates if necessary, until line-of-sight (LOS) to the target is attained. At this stage the launch aircraft is loitering within datalink range of the target and the WSO is watching his screen. Once the target is seen the WSO steers the crosshairs designating the missile's impact point onto the target or the part of the target he wishes to hit. At this stage a contrast lock within the GBU-15 may be engaged and the aircraft may escape, alternately the WSO may update the missile aimpoint as it nears the target or simply manually fly it to impact. The GBU-15 is thus highly accurate and with its 2000lb warhead offers a high probability of kill for most targets. As it allows standoff launches from low altitudes the probability of its launch platform being successfully attacked is also substantially reduced. 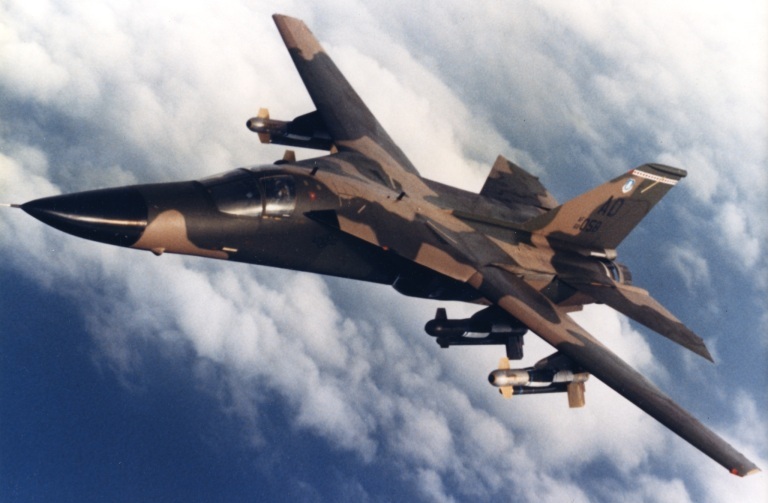 The RAAF F-111C carries the basic GBU-15, it is the most potent PGM in the RAAF inventory. However, the limitation of the GBU-15 lies in its standoff range which is quoted at 4nm for a low altitude launch. Thus the only means of extending the range of the glidebomb is to launch from altitude which also exposes the launch aircraft. This limitation can be a problem when hitting targets in heavily defended areas as newer area defence weapons such as the SA-11 Gadfly, SA-10 and late model SA-6 Gainful can hit targets at very low level. Unless the approaches to the target are favourably concealed, the penetrator will be exposed to fire from these weapons at ranges of at least several nautical miles. A powered derivative of the GBU-15 therefore offered a capability to hit this class of targets from below the radar horizon of ground based SAMS again restoring the qualitative advantage offered by the GBU-15. The AGM-130 program was initiated in 1984, with USAF Systems Command Armament Division at Eglin AFB acting as program manager and Rockwell International nominated as prime contractor. The USAF expressed an intention to purchase at least 2400 rounds by 1990 though at time of writing the programme was having a difficult time on Capitol Hill. While the basic AGM-130A bears a strong resemblance to its ancestor, the changes are substantial. Most notable are the redesign of the aft mounted cruciform wings which lost their swept leading edge, and the nose mounted strakes which are replaced with stubby winglets of greater span. The structure of the nose and tail assemblies was revised to accommodate a ventrally mounted Hercules rocket sustainer. After launch the AGM-130 will initially glide, then fire its powerplant which it jettisons upon burnout. The terminal phase is glide only which reduces both the heat and signature and radar cross-section of the weapon as it approaches its target. The quoted range of the weapon under these conditions is greater than 13nm. The nose mounted TV/Imaging Infra-Red seeker assembly of the GBU-15 appears to have been retained with the associated electronics module in the nose assembly. The rear WCU-8/B control unit may also have been retained although with whatever changes required to accommodate the new configuration. This unit offers the midcourse altitude and heading hold capability of its predecessor. The additional standoff range of the AGM-130 almost certainly led to difficulties with the previous AQX-14 datalink subsystem, which may be susceptible to jamming at such ranges. Harris-Magnavox Systems were awarded a US$42m contract to design a jam resistant Improved Data Link (IDL) subsystem for use with production AGM-130, the program is expected to cost above US$300m over its life. In most other respects the AGM-130 is much like the GBU-15 with a similar mode of attack. The basic subtype is the AGM-130A with a Mk.84 warhead and TV/IIR guidance. This weapon weighs 2917lb at launch, has a length of 154" (3.94m), fuselage diameter of 18" (0.46m), and a wingspan of 59" (1.5m). The AGM-130B subtype carries an SUU-54 submunitions dispenser and is somewhat lighter at 2560lb launch weight. The US DoD initiated development of the Tacit Rainbow missile in the early eighties, it became a joint USAF/USN program in 1984 with USAF Aeronautical Systems Division as the executive organisation. Tacit Rainbow represents a new class of missile, a harassment weapon. One of the fundamental difficulties encountered on defence suppression sorties is the tendency for the defending side to turn off its radars while the Wild Weasel defence suppression aircraft are clearing a corridor for approaching strike aircraft, but once the Anti Radiation Missile (ARM) firing defence suppression aircraft leave, the radars are reactivated and SAMS launched as required. To prevent this course of events, the defence suppression aircraft had no choice other than to loiter in the target area to force the hostile radars to remain off. This was extremely risky as these aircraft are exposed to AAA, small arms and various point defence SAMS which may be laser or IR guided. While high performance ARMs such as the AGM-88 A/B HARM have a high success rate, their endurance is very short and therefore once launched are committed to a target which must remain turned on until impact for an accurate hit. The whole matter then becomes one of the how many aircraft armed with ARMs can be maintained over the target for the duration of the various phases of the strike. It is not reasonable to assume that the Warpac would do NATO the favour the Libyans did the USN, i.e. leave their radars on throughout a strike (attracting HARMs). The option of launching an ARM with the ability to loiter for at least the duration of the strike is therefore attractive. Once such a missile is launched it will wait for a radar to turn on and destroy it if it remains active. This is the role of Tacit Rainbow, which will loiter in programmed airspace, autonomously detect and prioritise hostile emitters and will attack them if appropriate. The Northrop Ventura designed airframe of the Tacit Rainbow is fairly conventional for a high speed drone, with a dorsal inlet for the miniature air breathing powerplant, a fixed vertical stabiliser, a folding keel surface, folding horizontal tail and swivel folding straight wing. While few figures have been released relating to this once classified system, available drawings indicate a length of 100", a span of 61" and a fuselage envelope diameter of about 15". This would place the weapon, given the low density of its JP style fuel, in the 600lb launch weight class. Given the involvement of Williams International as powerplant supplier, a derivative of the WR-24 series in the 250-300lb thrust class is a reasonable guess; this would offer a better thrust/weight ratio than a cruise missile while allowing the packaging of the engine in the fairly slim fuselage. The forward fuselage diameter appears adequate to accommodate the type of antenna and RF seeker used in HARM, similarly the Shrike style 145lb warhead used in HARM could be accommodated. With Texas Instruments involved in the program, it is very likely that a lot of the technology used in HARM found its way into Tacit Rainbow; certainly the capability of the HARM seeker to prioritise threat emitters and select the highest threat for attack, when in Self Protect mode, would be ideal for this weapon. The involvement of Singer Kearfott in the program suggests an accurate inertial reference unit for navigation, probably a ring laser gyro which could provide outputs for the autopilot. The contribution of Boeing Military Aircraft Co. is less clear but, given past projects, software for interfacing the missile to launch aircraft is a reasonable guess. Maintaining the assumptions above and assuming that the forward third of Tacit Rainbow contains seeker, autopilot/INS and warhead, it appears that about 100lb of fuel is carried which could offer an endurance of at least 20 minutes. The real figure is no doubt a well kept secret. An unusual feature of Tacit Rainbow are the pair of apertures in the tail. The lower is almost certainly the exhaust of the jet engine, the upper given its size could be an exhaust nozzle for a high impulse rocket which would be fired during the missile's terminal dive at a target. If used this would reduce the decision time available to the victim radar operators. 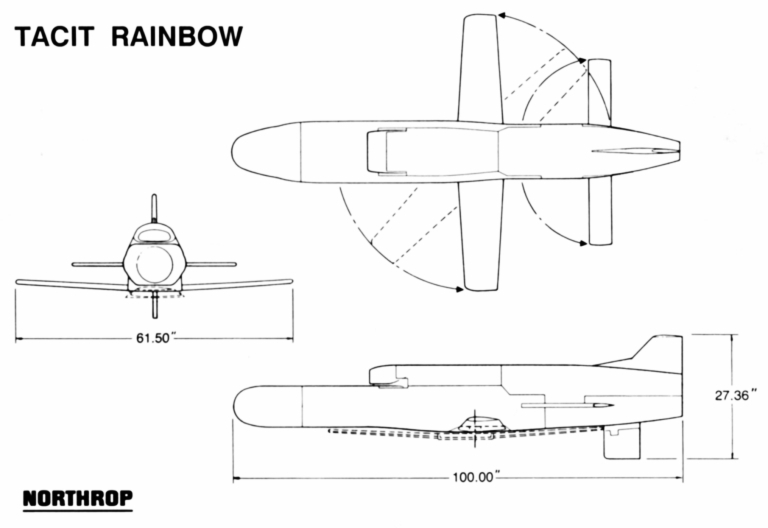 Tacit Rainbow is carried with wings, keel and horizontal tail folded, on a standard ejector rack. Trials are being carried out using B-52G, A-6E and A-7 aircraft. Prior to launch Tacit Rainbow will need to be initialised with target location, this would probably be via the aircraft's 1553B multiplex bus. 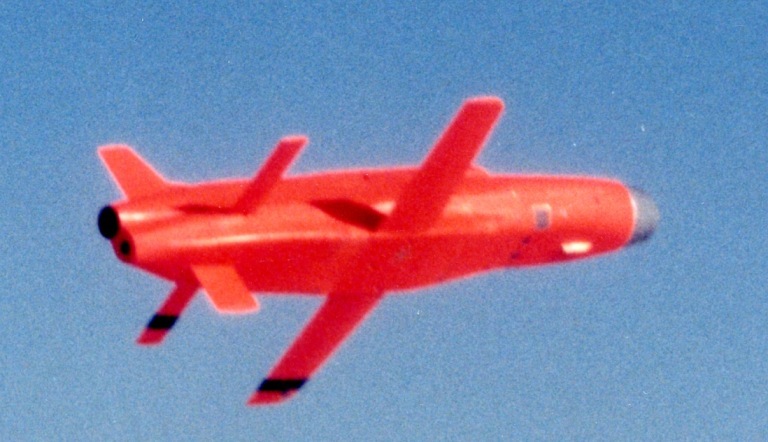 Once released the turbojet fires up, the wings swivel into position and tail surfaces unfold and the missile cruises toward its programmed search area. There it will follow a programmed pattern listening for an emitter which fits the profile of a suitable target. Once such a target is detected, Tacit Rainbow dives onto it and destroys or disables it. The dorsal inlet reduces the probability of detection by surface radar, while its small size and low heat signature/plume size reduce the likelihood of visual or infra-red detection in clear weather conditions. Tacit Rainbow is planned for NATO deployment and would also be launched from ground vehicles including the MLRS system. Trials are currently in full swing, with full scale development to be completed this year, when an initial production decision is to be made. Final assembly of the missile would take place at Northrop's new Georgia Production Center, currently being constructed at Perry, Georgia. Modern Precision Guided Munitions offer a broad range of capabilities and attack profiles, these attributes translate directly into greater degrees of freedom for the tactical strike planner. This aspect of their application is perhaps one of the most significant, as it creates unprecedented difficulties for the defending side both in terms of physical deployment and sought capabilities of defensive systems. In our Australian context, the PGM can effectively multiply the potency of a numerically small strike force while imposing insurmountable technical difficulties upon any regional threat with an intent to counter these weapons. Surgical application of force against key hostile assets then becomes an issue of a political nature, rather than a risky and potentially embarrassing application of major resources which sets the stakes far higher. Standoff PGMs must be viewed in this context, as a means of increasing the number of options a commander has available. Failure to recognise this over the longer term could have less than desirable consequences.